Does a conflict of interest exist in San Jose's Retirement Services Department? That’s the question some officials are asking about San Jose’s pension system after seeing internal city documents uncovered by the NBC Bay Area Investigative Unit. Now we examine the possible influence city officials have had on what’s supposed to be independent information. The internal emails tell the story. “Do you feel like you’ve been lied to?” Watchdog Reporter Jenna Susko asks Police and Fire Retirement Board member David Bacigalupi. “I do, I do,” Bacigalupi responds. “And you feel like information has been withheld?” Susko asks. He’s talking about emails between city employees that show conversations about San Jose’s future retirement costs. They are discussing filtering information. “My fellow new board members, they are going to be shocked when they see all this,” Bacigalupi comments after seeing the emails. He’s talking about members of San Jose’s two retirement boards. They oversee multi-billion dollar retirement plans and make critical decisions about how much public money goes toward funding pensions. To help make decisions, the board hires an independent actuary to analyze the city’s finances and project future retirement costs. The company currently doing the job is Cheiron. However, Cheiron’s independence is now being questioned by board members. “Is any amount of influence acceptable?” Susko asks Bacigalupi. “No, Not at all,” he responds. We obtained emails between San Jose’s Retirement Services Director, Russell Crosby and that independent actuary, Cheiron. In this message, Cheiron sent Crosby the draft version of a report to be presented to the board. Crosby wrote back, requesting Cheiron alter slides. Cheiron apparently planned to show extending amortization to 25 years, but Crosby was “against” that, so the information was removed. Click here to see the draft and the final version. “There is definitely influence going on,” Mike Pisula, an actuary in Pittsburgh, tells NBC Bay Area. Pisula's company provides actuarial services for smaller municipalities and says he is not a competitor of Cheiron. We asked him to look through presentations, city emails and public documents then give his professional opinion via satellite interview. “Overall, do you believe information was withheld that could have affected decision making by the retirement board?” Susko asked Pisula. “The information on slide six was withheld from the December presentation,” Pisula responds. The original slide six and the changed version that was actually presented to the board can be viewed here. After Crosby asked if both tables were needed in another email, Cheiron’s CEO responded, yes, but Crosby asked him to reconsider and so he acquiesced. Click here to view the email chain. Gene Kalwarski is the CEO of Cheiron. We caught up with him at a Retirement Board meeting last month. “Has anyone with the city ever asked you to change slides or delete slides from your presentations?” Susko asks Kalwarski. “I do. I include Russell Crosby,” Susko responds. “They make suggestions, we give them draft slides, and if we think their suggestions would enhance,” Kalwarski trails off, “there’s give and take so there may be changes, but nothing strikes me as significant here,” he says. 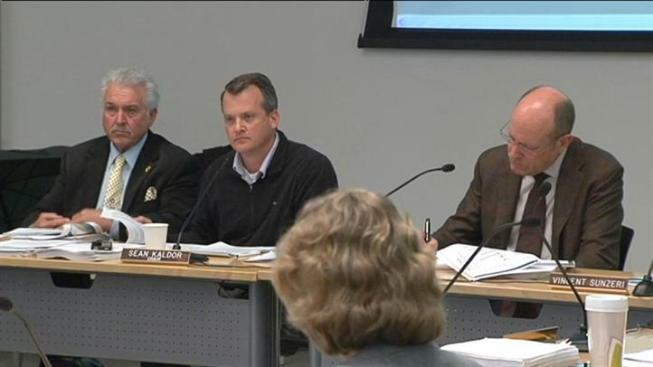 “To say, ‘I don’t like this recommendation and I want you to change it’, that’s not how the process is supposed to work,” Chair of Police and Fire Retirement Board, Sean Kaldor tells NBC Bay Area. We found other information being withheld. This time from Kaldor. Kaldor emailed a city employee asking how pay-cuts would affect pension projections in this note. However, he says, “I would rather not point this out” to Kaldor, the board’s chair. You can view the email chain here. “Does it make you upset to see that?” Susko asks Kaldor as he reads over the emails. “And you were not provided that information?” Susko asks. “That is correct,” Kaldor replies. “I would be very concerned if I was on that board,” Judy Nadler is a senior fellow in government ethics at the Markkula Center for Applied Ethics at Santa Clara University and is a former mayor of the city of Santa Clara. We showed her some of the emails. And some board members are. “So, you have no doubt in your mind that Russell Crosby over-stepped his boundaries?” Susko asks board member Bacigalupi. Russell Crosby and his boss, City Manager Debra Figone, declined our requests for an interview. Instead, Figone issued us this statement. In it, City Manager Figone says steps have been taken to restructure the Retirement Board already. She also says "if either of the retirement boards were dissatisfied with the Director of Retirement Services, the board could report their concerns to me. I would consider this feedback as part of the perofrmance appriasal process." And remember Mike Moehle, the city employee who didn’t want to tell the board’s chair about the real numbers? Guess where he works now? At Cheiron. Working on San Jose’s retirement projections. “Could this be a problem?” Susko asks Nadler about Moehle now working for Cheiron on city projects. According to Cheiron’s contract with the city, San Jose employees are “disqualified” from employment (see page 9 of the contract) because it’s a violation of the Revolving Door Ordinance. However, if you look at the dates on these emails, it appears he began working for Cheiron on San Jose projects before he got the OK from the city council. “Should the public be outraged by this?” Susko asks board member Bacigalupi. The structure of the retirement system is also in question. Do you have something you want us to check out?